Someone has to have the final say in the world, and that person is represented by the Authority card. Authority represents leadership and power, and as such, is inherently neither good nor bad. He is willing to defend those under his tutelage. The compassionate Authority looks beyond what only benefits him and makes decisions based on what is best for the common good. Authority has the wisdom and experience to provide the building blocks for the structures that will follow. He is systematic and plans carefully with long term goals in mind. His building blocks take the form of laws, boundaries, and final decisions. The lack of Authority would lead to chaos. 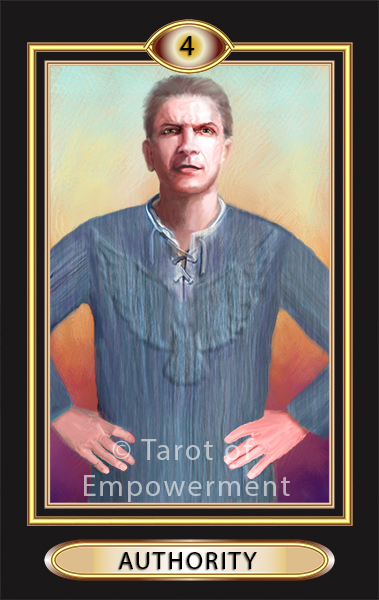 In Tarot of Empowerment, Authority stands with focused attention, intently listening and observing the situation before deciding the best course of action. He understands and accepts that he will take full responsibility for the outcome of his decision. Upright: When Authority comes up for you in a reading, it suggests that you are being called upon to be a leader in the situation. You must be willing to accept the consequences of the actions you are declaring. Take the long term goals into consideration before you decide. When the card represents another person, you must understand that you have less control and independence than that person in the situation. Empowerment: You are empowered by Authority when you take actions for the betterment of your community and justly define boundaries and accept the consequences. Reversed: In a reversed position this card suggests looking inward for your courage to be responsible for the good of the community. As a card representing a block, you may be putting your own interests before that of the greater good. It can also indicate an unwillingness to take action for fear of the consequences. Numerology: Authority is identified with the number 4, which signifies organizational skills, reliability and the ability to work hard. The other card that reduces to 4 is Life Cycles (13). We invite you to join our community to share your stories of how Tarot of Empowerment helped to empower yourself or those for whom you read.